We had never owned China before. Instead, we just had traditional white dishes — a complete, matching set of plates and bowls. The everyday, durable kind. We had enough to serve twelve. Seems reasonable for a family of two, right? When we moved into a tiny studio apartment with few cupboards, we had no choice. Most of our beloved dishes had to go. We decided on a complete set of dishes with service for six. Nothing more. Well, if we could only have a few dishes, wife wanted them to be fun! 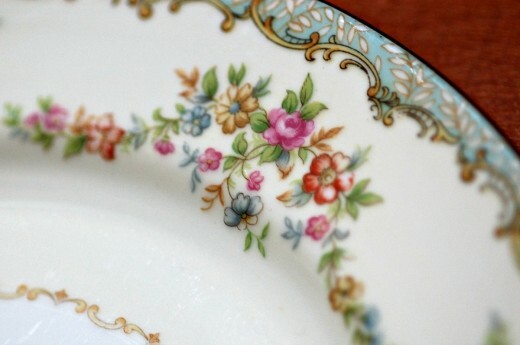 We enjoyed finding used China together. Dishes which are pretty but not too girly. The kind of China people put in a fancy glass cabinet to protect them from getting chipped or cracked or otherwise damaged. Except that we use our China every day. We’re done storing things for undefined future use. “Having your cake” is just not for us. The plates and bowls aren’t perfect anymore. There are definitely a few chips and hairline cracks. But we want our stuff to wear out from use instead of collecting dust. No more saving it for the next owner! Do you have anything you’re preserving for the future? What would it be like to start using it regularly, as its creator intended?